Fort Thomas Police officers will be equipped with body cameras by the end of the year. FTM file. The Fort Thomas Police Department has been approved to equip all officers with body cameras by the end of this year and as early as the next few months. 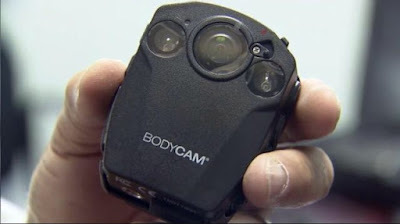 A recent budget approval will finally allow officers to receive the cameras the department has been testing the last two years. The cost of the project is approximately $7,000, with each camera costing between $300-400. The department has applied for a grant to cover some of the costs and will know if they receive that assistance in September. Lt. Rich Whitford has seen the benefit of having all 23 officers equipped with the cameras as it can protect officers as well as suspects. Body camera footage can be used for court purposes and provide accountability and documentation of actual events as they occur. Since the 1990s, our police cars have had mobile camera units which have been very successful for DUIs and traffic stops, but body cameras will offer a different a point of view, those that can not be seen or recorded from a traditional dash cam. Sometimes officers have to be away from their vehicle, ensue in foot pursuits or vehicle and property searches. A body camera goes with and is activated with a push of a button. For the past couple years, Fort Thomas officers have tested various units and brands including the Muvi lapel camera and i-Kam extreme sunglasses to see what best fits the department, taking into consideration the budget as well. FTPD will be purchasing ProVision body cameras. FTM file. Whitford calls the body cameras the "wave of the future" and a necessity, stating that they, of course, have pros and cons, but will, ultimately, be a very beneficial safeguard. "With today's times, transparency being the big word, this will improve accountability with residents, what's going to be expected of police officers, will help protect the citizens from misconduct and helps protects officers from false claims," Whitford said. Det. Adam Noe agrees that the body cameras are good for use during investigations. Interviews can be documented right on the scene. Instead of note-taking, the body cameras will provide an actual word-for-word account. Officer Brandon Laffin is already using a body camera on patrol. FTM file. Police Sgt. Chris Carpenter says his officers have no issues using the body cameras and understand there are limitations. "The public needs to understand there are limitations, however, depending on camera angle, lighting, perspective and what has happened before the recording began, Carpenter said. The public also needs to understand that lack of video evidence doesn't necessarily imply wrongdoing on the part of police. A police contact that occurs quickly and/or involves a high amount of survival stress may result in the officer not having time to activate or not thinking to activate the camera. Our officers are trained to react quickly in violent situations, and when it comes to the priorities of survival responses, turning on a camera is obviously low on the list. Taking an extra second to activate a camera means an officer is a second slower in responding to a threat (reaction is always slower than action to begin with)." In a Spring 2015 edition of Kentucky Law Enforcement Magazine, Carpenter stated that he did not see any concern about how video recordings would affect relationships between officers and the public. He added that from his experience, the use of body cameras has improved officer behavior and confidence. "The benefits of body-worn cameras, in my opinion, greatly outweigh any concerns with their use," he added. While there are many factors to consider with the use of body cameras, Fort Thomas is working hard to train officers to use them and committed to implement them in protecting the community.